B1686. F.W. Gaisberg. 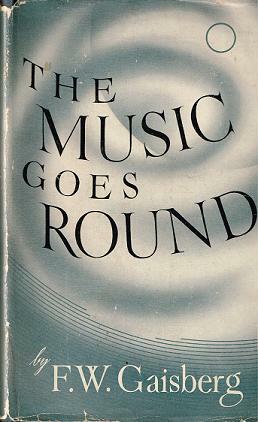 THE MUSIC GOES ROUND. New York, Macmillan, 1942 (First Edition, stated; Blue Cloth binding). 273pp. Index; Photos; DJ. Wonderful copy’s jacket shows a little wear at spine ends and along bottom & top edges. A choice example of this rare and important book. 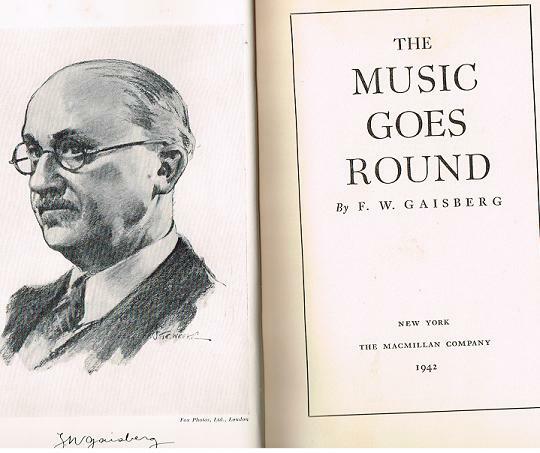 “Frederick William Gaisberg (1 January 1873 – 2 September 1951) was an American-born musician, recording engineer and one of the earliest classical music producers for the gramophone. He himself did not use the term 'producer' and was not an impresario like his protégé Walter Legge of EMI or an innovator like John Culshaw of Decca. Gaisberg concentrated on talent-spotting and in persuading performers to make recordings for the newly invented gramophone. 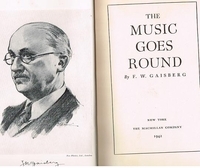 Gaisberg began working in the recording industry in America as a young man, becoming a pioneer of early recording, and also worked as piano accompanist. In 1898, he joined the Gramophone Company in England as its first recording engineer. In 1902, he recorded music sung by the tenor Enrico Caruso and the recordings became a sensation. By 1921, Gaisberg was artistic director of HMV's international artists department. After 1925, he concentrated on artist management. In 1939, he retired from his position but continued as a consultant in the industry through the 1940s.